For the March issue of Grow Northwest, I offered to write a cooking piece on Irish food. I cleverly sidestepped corned beef and cabbage and soda bread, and instead used it as an excuse to make a really fabulous Guinness-braised pot roast and a lovely batch of buttermilk colcannon. I also made cake. 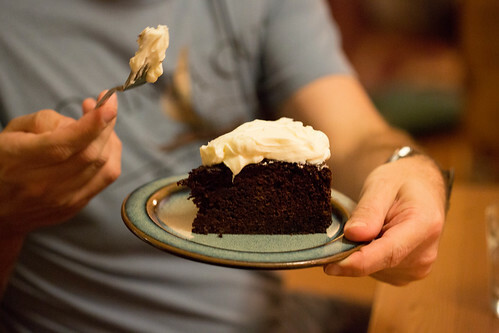 From my research (and my parents’ experience), the real Irish version of Guinness cake is a fruity, spiced teatime sort of thing, rather than a sweet dessert. 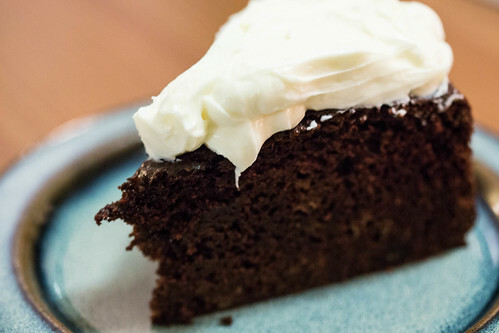 I remembered Jon making a chocolate Guinness ice cream from David Lebovitz’s ice cream book, and wanted to find a good recipe for chocolate stout cake – I eventually found it in Nigella Lawson’s Feast. And what a cake! We’ve made it twice now, and I think it’ll be in regular rotation in our house. 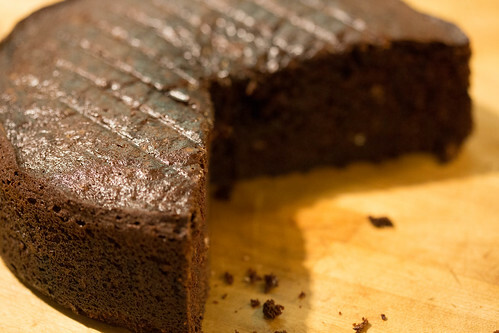 It’s chocolatey but not too sweet, dense and moist, and keeps perfectly, wrapped on the counter, for up to a week. I think it might freeze well but so far we haven’t had enough leftover to try it. It’s very good eaten plain, but a dollop of cream cheese frosting is extremely nice. 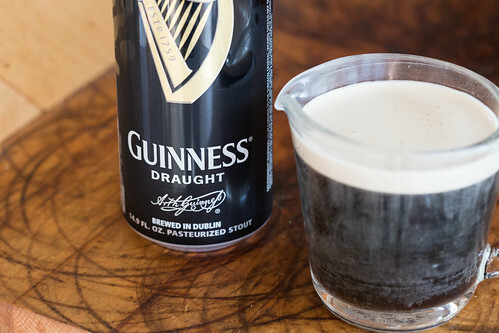 I had meant to get this post up before Saint Patrick’s Day, but if, like me, you still have a lot of Guinness left in the fridge, this is the perfect thing to use it for. And even though you can find the recipe in my original article, I’m reprinting it here, because I think everyone should make this cake. A lot. Preheat the oven to 350°. 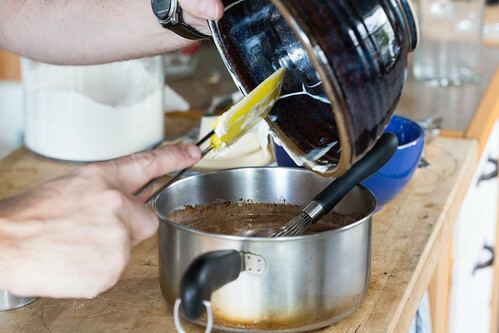 Butter a 9-inch springform pan and line it with parchment paper. Heat the Guinness and butter together in a large saucepan until the butter melts. Remove from the heat and stir in the sugar and cocoa powder. Whisk the sour cream, eggs and vanilla together in another bowl and add them to the pan. 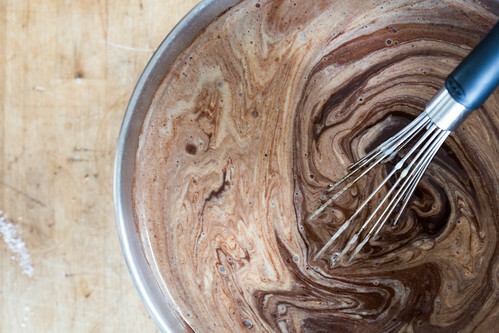 Add the flour and baking soda and whisk everything until smooth. 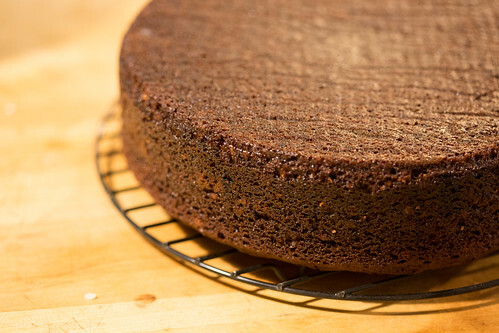 Pour into the prepared springform and bake for about an hour, until the cake has set and doesn’t seem too jiggly. Let cool before removing the springform (if you unmold it too soon it may fall apart, as it’s very moist). Serve in wedges with whipped cream, cream cheese frosting, or all by itself. Could easily be made a day ahead of time – wrap in plastic, store at room temperature, and frost just before serving. Will be making this for an upcoming birthday party. Thanks for sharing this awesome recipe! You’re welcome, I hope you love it as much as we did! That sounds really good… Any suggestions on replacing the sour cream? That’s something that we absolutely, positively never have around the house. Hmm. Sour cream gives such a good flavor and texture here that it might be worth buying just for the recipe, but you could definitely try substituting buttermilk or yogurt. 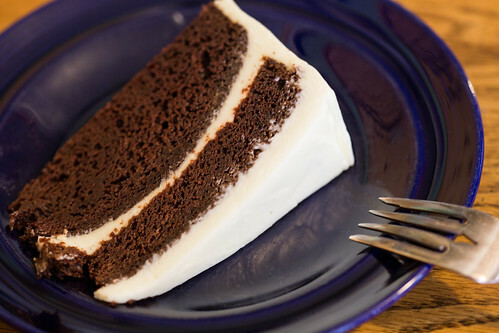 If you’re avoiding dairy altogether, it might work to just leave it out but without doing some research I’m not sure what effect that would have on the cake – you’d probably want to cut down the baking soda, at least, since you wouldn’t have the acid from the sour cream. Or you could try coconut milk, which also wouldn’t be acidic but might be tasty. No, not trying to cut out dairy. As far as I’m concerned, if you’re going to cut out dairy, you may as well just try a non-cake recipe that doesn’t use dairy at all, like a pie or something — although the coconut milk suggestion is intriguing; I’ve never baked with coconut milk. But maybe I’ll try getting some sour cream just for the recipe. Thanks for the suggestions! I’ll let you know how it turns out.